Conservative pundits assailed Kaepernick’s “lack of patriotism,” or capitalized on the “dumb jock” stereotype to dismiss him as an “an idiot.” Not surprisingly, Kaepernick was the target of racial slurs and blatant racist attacks, on and off social media, while prominent NFL personalities questioned the bona fides of his blackness because Kaepernick is biracial, and the adopted child of two white parents. Nearly every dimension of the embattled Kaepernick’s identity – from his love for country to his racial identity, the particulars about his family life to his personal relationships – have been closely scrutinized and callously attacked. Kaepernick’s seated protest, which converges with proliferating anti-Islam sentiment in America, has also led some to insinuate that Islam is the catalyst spurring his “hate for America.” Yes, even Kaepernick’s faith is at question, during a time when Islam is perceived to be far more than a religion, but in line with a trumped-up subset of Kaepernick’s detractors, a religion viewed as a threat to American values and national security. Brown, bearded and seated – Kaepernick’s rumored conversion to Islam has injected the political discourse of anti-Muslim hatred and fear into the realm of sport, prompting bigots to impose fear, suspicion and stereotype of the faith onto the quarterback. Once celebrated as a “double threat” for his throwing and running prowess as a quarterback, Kaepernick’s pro-black political consciousness and rumored conversion to Islam brings new meaning to that term – and the attendant hate by bigots in NFL stands and beyond. Team America or Team Islam? 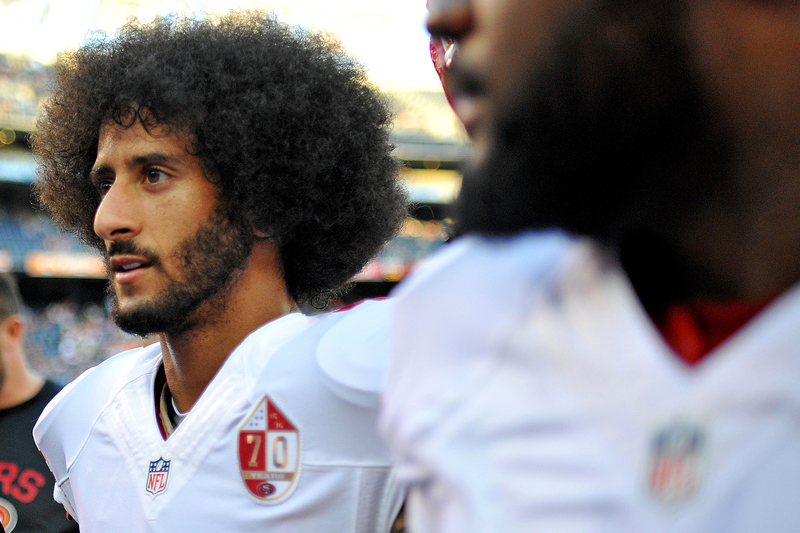 Before and after refusing to stand for the national anthem, Kaepernick made no mention of religious conversion or (general) appeals to faith while articulating his political views. However, fringe conservative media promoted the rumor that the quarterback’s political stance was fueled by a recent conversion to Islam. Their definition of Islam presented in the menacingly familiar terms perpetuated by GOP presidential candidate Donald Trump, and the damaging stereotypes of the faith that preceded the 2016 presidential race. San Francisco 49ers quarterback Colin Kaepernick before the game against the San Diego Chargers at Qualcomm Stadium. The religion, or religious conversion, of an athlete causes greatest alarm when Islam is at play. This is particularly true if the athlete is black or brown and uses his platform to voice critical politics or empower marginalized people. Indeed, the conflation of Muslim identity and political radicalism is not peculiar to sports, illustrated most famously by Muhammad Ali’s conversion after becoming the youngest heavyweight boxer to claim the title in 1964 and, mirroring Kaepernick’s protest, the Denver Nuggets’ Mahmoud Abdul-Rauf standing against American injustices by remaining seated during the national anthem in 1996. Kaepernick’s political consciousness is seldom linked to his academic excellence or intellect – he boasted a perfect 4.0 GPA at the University of Nevada-Reno and a scored an impressive 37 on the NFL’s Wonderlic test, which measures the intelligence of NFL prospects. Likewise, his political activism is hardly connected to his membership with Kappa Alpha Psi, a black fraternity built upon academic excellence, political leadership and community empowerment. Without question, these factors were central in Kaepernick’s development as a political being and thinker, in conjunction with the trials of being a young black man in an America where systematic police brutality and the prison industrial complex disproportionately target his specific demographic. Like many young black men, Kaepernick’s activism cannot be divorced from the emergent Black Lives Matter movement and the racial inequities and injustices that prompted it. Yet, fixation on and fear of Islam is the culprit for a swelling chorus of Kaepernick’s most vile detractors. Doctored photos of Kaepernick donning an ISIS T-shirt or transposing his face on the profile of Osama bin Laden have been circulated through social media and retweeted by an audience mobilized by inflamed rhetoric and emboldened hatred for Islam. Others tweeted that “Colin Kaepernick looks like he would be a member of ISIS,” slander that escalated but was also prevalent before his recent protest. For this swelling element, Islam is less a religion; but a geopolitical menace and hateful ideology that stands against American democracy, and sits during the national anthem.